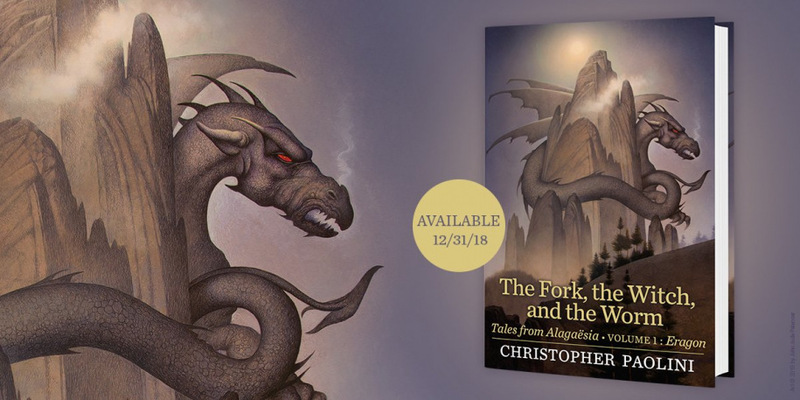 For the first time in 7 years, we return to the magic land of Alagaesia with three all-new original stories! These 288 pages will transport us back to the land of spells, magic, and dragons. Back to the world of Alagaësia. So we know there's going to be more Alagaesia, more Eragon, more Saphira, and maybe even more Angela! We left Alagaesia 7 years ago - who would you like to catch up with? What stories would you like to read? As you know, we were running a countdown on the MCAlagaesia Discord server, and many of you were surprised when we gave you the news almost an hour early!! 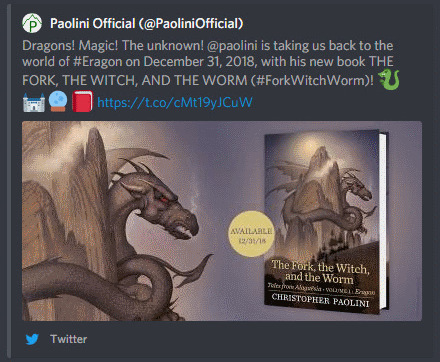 Almost 200 people retweeted Paolini's announcement before it was taken down on both his personal and the PaoliniOfficial accounts. However, the original tweets have been deleted. But never fear! We have them immortalised here for posterity. Of course, they should be back up soon! We've only just learned that we will be enjoying 3 new short stories this year - but could there be even more in the works? I'm sure the astute among you will have seen the words "VOLUME 1: ERAGON" on the bottom of the book. Surely this means we can expect even more stories based around our other favourite characters in the near future! 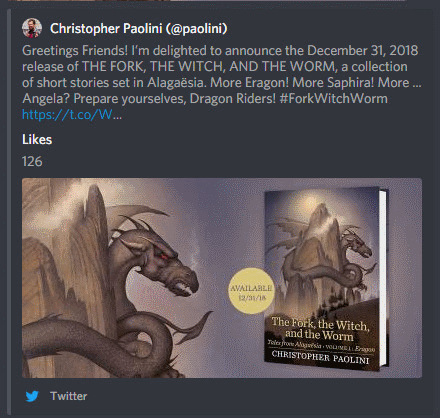 Mere seconds after the announcement, hundreds of thousands of dedicated Inheritance Cycle fans poured in to the official Inheritance Cycle fansite, http://shurtugal.com/ to find out as much as they could. Not all of them could get in though - it seems the magnitude of the news surprised everyone, and nobody was prepared for the massive spike in web traffic! We're hoping the DDoS mitigation provider Cloudflare can get the site back online soon so that readers can find out everything we know about the new book. For the latest news, check out http://www.shurtugal.com/!